Catching up on sustained catch reports : Spotted Wing Drosophila Latest information from the NYS IPM Program. Sustained catch (two weeks in a row catching SWD) has occurred in several counties: Orleans on June 15 and 22, Niagara on June 28 and 29, Ulster on June 28 and 29, Clinton on July 10, Essex on July 10, and Livingston on July 13. SWD infestation on raspberry causes fruit receptacles to stain red, druplets get sunken dimples, and leaking fruit sags. In Essex County the sustained catch had 144 SWD, caught during the week ending on July 10, 2017. End of July and early August marks a time frame when SWD numbers in berry crops will increase significantly. Exponential population growth typically occurs in August. 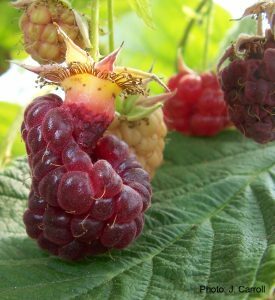 Raspberry fruit may begin to show obvious signs of infestation. Blueberries may also become infested and show signs of fruit infestation. Orleans County – June 15 at a raspberry site 1 SWD caught in 1 of 2 traps. On July 3, there were 3 SWD caught. Orleans County – June 22 at a blueberry site 2 SWD caught in 2 of 2 traps. On July 5, there were 10 SWD caught. Niagara County – June 29 at a raspberry site 8 SWD caught in 2 of 2 traps. On July 5, there were 12 SWD caught. Niagara County – June 22 at a blueberry site 12 SWD caught in 2 of 2 traps. On July 5, there were 5 SWD caught. Ulster County – June 28 at a raspberry site 48 SWD caught in 4 of 4 traps. Ulster County – June 29 at a site with both raspberry and blueberry 17 SWD caught in 4 of 4 traps. Clinton County – July 10 at a site with both raspberry and blueberry 26 SWD caught in 4 of 4 traps. Essex County – July 10 at a raspberry site 144 SWD caught in 2 of 2 traps. Livingston County – July 13 at a site with both raspberry and blueberry 6 SWD caught in 2 of 2 traps. Information is from Tess Grasswitz, Lake Ontario Fruit Program; Jim O’Connell, Ulster County Cornell Cooperative Extension; Amy Ivy and Annie Mills, Eastern NY Commercial Horticulture Program; and Jennifer Damon and Dave Thorp, Livingston County Cornell Cooperative Extension.